Aller makes a very extensive range of air purifiers for homes, offices and larger scale applications commercial and industrial applications - and have some prestigious clients such as MIT, the United States Military and IBM. 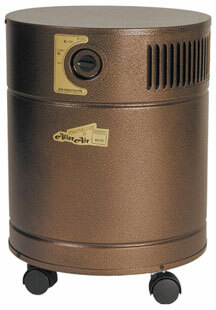 They even make an air purifier specifically for welding applications! Aller makes units that are stand-alone, as well as products which can be integrated into an existing or new HVAC system. Aller air purifiers intended for home use - such as the Aller 5000 Vocarb - contain both medical grade HEPA filters (stated to remove 99.97% of airborne particles down to 0.3 microns in size) and activated carbon filters to remove VOCs from the air. Aller has several models available - and this offers a possible way to find a solution that is specific to particular air purification requirements. Aller makes an air purifier specially to address the needs of smokers. They claim to be the only manufacturer making a unit with a tar trap - and that this prevents tobacco smoke from shortening the life of the filters. The Allerair 5000 DS air purifier's tar-trapping pre-filter grabs larger particles and tar, and this is also said to extend the life of the HEPA filter and activated carbon filter stages. It is well known that more effective gas-phase filtration can be achieved by greater masses of activated carbon. The Allerair 5000 DS features 22 lbs of activated carbon, and if even more is required, the DXS model features a deeper 28 lb carbon filter. Aller even offers models specially tailored to work close to printing equipment. This might sounds curious but it's valuable to understand that photocopiers in particular have garnered something of a reputation for producing toxic air pollutants during operation. This may have been addressed with newer machines but many photocopiers are several years old. These Aller air purifier models are designed with the intention to remove the atmospheric pollutants (such as VOCs, dust and ozone) that can be created by photocopiers and printers. Looking through the range, there are some really hefty models - such as the Aller Air Defender 1500 - which features an amazing 88 pounds of activated carbon and an option to fit a UV lamp for additional air sterilization. Aller's range features special models for restaurants (such as the Aller 6000 Stainless), commercial applications (such as the Aller 8000 Exec), and models such as the Aller Air Medic Plus and Aller CleanBreeze Medical - which are tailored to medical uses. There are models such as the Aller AirRhino 200 Carbon which is aimed at post-fire and flood cleanup. Air-purifiers-online.com likes this, and also is impressed by the large amount of activated carbon Aller packs into some of their larger units.